Registered Nurse Loda Mshiu wears standard personal protective equipment to guard against health care-associated infections during a recent operation. Singida, Tanzania—For Dr. Joseph Malunda, Medical Officer In-Charge of Singida Regional Hospital, rounds begin an hour earlier than regular reporting time. He visits all departments of the hospital to ensure that things are in order before the formal start of services. In particular, Malunda is looking at compliance with infection prevention and control (IPC) standards. He wants to ensure that the 500-plus clients who come to this government facility every day receive the best and safest care, and that the hospital’s more than 300 health care workers also are protected from infection and injury. Malunda has every reason to be vigilant. Infections acquired in health care settings are one of the leading causes of disease and deaths globally—and even more so in low-income countries. In Tanzania, the World Health Organization estimates that 15 out of every 100 clients receiving care will acquire an infection. Of particular risk for health care workers are blood-borne pathogens, which can be passed through needle sticks and other accidental injuries, or the presence of blood and body fluids. Such exposures can result in transmission of hepatitis B or C, HIV and other serious infections. With support from the U.S. President’s Emergency Plan for AIDS Relief (PEPFAR), through the U.S. Centers for Disease Control and Prevention (CDC), Jhpiego is leading efforts to address IPC in hospitals across Tanzania by building the capacity of the Ministry of Health and Social Welfare. Through this initiative, Jhpiego is partnering with Singida Hospital and 28 other health facilities on the mainland and in Zanzibar to implement its innovative Standards-Based Management and Recognition (SBM-R®) approach to improve IPC practices. The program has also provided facilities with key infection prevention equipment, such as color-coded waste bins, liners, aprons, gum boots, surgical gloves and caps, and more. The commitment and dedication of Singida Hospital’s top administrators to proper infection prevention practices have contributed to the hospital being recognized as one of the leading centers of excellence for IPC in Tanzania. During his morning visits, Malunda often meets Agrippina Lolo, a medical attendant responsible for routine cleaning and for ensuring that the facility maintains high hygiene standards. “I have to wear protective equipment for both my safety and that of the clients when I am cleaning the operating theater or when I am handling waste. But, I am not worried because … I am always fully protected,” says Lolo, who, on this particular morning, was holding a floor mop, and wearing utility gloves, a plastic apron over her uniform and gum boots. In the operating theater, Malunda encounters scrub nurse Loda Mshiu, who glances at the big clock on the wall. Ten minutes have passed since she placed surgical instruments to soak in a large plastic container with 0.5 percent chlorine solution to decontaminate them. It was time to transfer them to another container filled with soapy water, where she will scrub them, then rinse them in a separate container of clean water and lay the instruments out to air dry. Wearing protective gear, Mshiu, who started at the hospital 30 years ago, knows too well the importance of IPC. “When I started back then, infection prevention and control … all these things you see me wearing were not here. In the 80s, we were not even wearing gloves while assisting women to deliver. And the instruments, we only soaked them in soapy water,” says Mshiu. “When I think of that time, I am so scared. I am just lucky, very lucky. 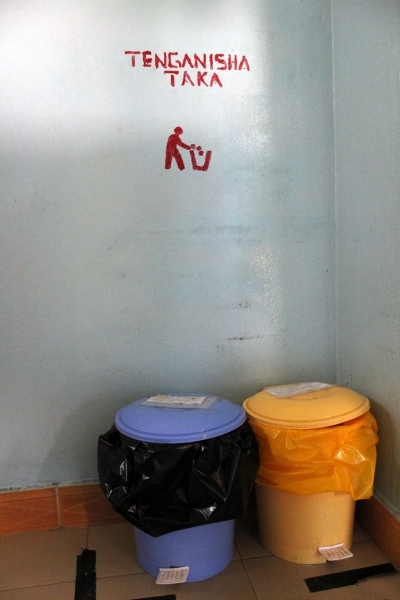 Color-coded bins are an easy way for health care workers to properly and safely segregate medical waste. IPC is a priority for Malunda. During his sunrise rounds, he often takes notes, sometimes even photos, of situations around the hospital that he will later reference as a best practice or suggest for improvement. “As an infection preventionist, it is very satisfying to see hospitals such as Singida doing their best. Their high IPC performance score is reflective of the quality and safety of the services they provide to the communities they serve,” says Dr. Albert Komba, Jhpiego’s IPC Advisor. “As leaders, our main role has been to encourage colleagues to get the job done. 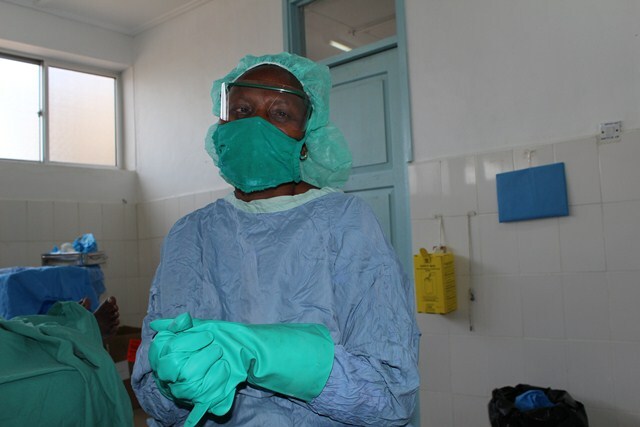 Eventually we got everyone in the team committed to the cause,” says Dr. Suleiman Muttani, the former Medical Officer In-Charge who currently works as a consultant obstetrician/gynecologist at Singida and coordinates research activities for the facility. Malunda and Muttani are an inspiration to their colleagues. Despite opportunities to work in cities where most health care professionals prefer to live, they instead decided to come to Singida, a relatively remote region that is an 8- to 10-hour drive from Dar es Salaam. They also admit that it has not been easy to change things at the hospital, and that they didn’t get to where they are without help. “And then Jhpiego came to Singida, and that was a huge boost to us,” he says. For more than 20 years, Jhpiego has been an international leader in advocating for and implementing evidence-based standards for infection prevention practices that protect both the client and the health care worker, developing and implementing efforts in more than 40 countries. Since 2011, the Jhpiego-supported IPC program has worked with the quality improvement team at Singida Hospital to set clear objectives in areas identified with critical gaps. Through training and on-site coaching, the program has helped the facility implement the national “Infection Prevention and Control Standards for Hospitals in Tanzania”—an assessment tool of 60 standards addressing a range of health care and support services. “IPC is a cross-cutting issue hitting all parts of the health facility. The Jhpiego IPC program helps hospitals to ‘sweep out the dirt from all corners,’” says Natalie Hendler, Jhpiego’s Infection Prevention Project Director. “The national IPC standards lay out expected IPC performance at each department, or functional area, of the hospital. So, we are working on IPC in highly sensitive departments such as the operating theater and surgical ward, as well as the out-patient department, kitchen, laundry, etc. Infectious pathogens can be lurking anywhere,” Hendler explains. To ensure adherence to IPC standards, Jhpiego has designed a series of on-site, strengthening activities using short training courses to reinforce certain skills, such as those scrub nurse Mshiu demonstrated, including instrument processing to ensure safe decontamination, cleaning and sterilization of re-usable medical instruments. Instrument processing is a big challenge for most facilities. Jhpiego IPC experts and Jhpiego-trained national IPC trainers visited each regional hospital and worked one on one with staff charged with instrument processing. This direct approach ensures that health care providers like Mshiu understand the correct dilution for chlorine solution; decontaminate instruments correctly and wash them in a manner that minimizes splashing and injuries; and sterilize the instruments for the appropriate amount of time under acceptable temperature and pressure. At Singida Hospital, facility staff have been able to meet all criteria for decontamination post-training. The hospital has also seen remarkable improvements in other performance standards, such as those related to cleaning (from 73 percent to 91 percent); adherence to sterilization procedures (from 38 percent to 69 percent); and infrastructure for instrument processing (from 9 percent to 64 percent). Jhpiego also devised and implemented a process to troubleshoot maintenance and repair of facility autoclaves and dry heat sterilizers, crucial equipment that is often in disrepair. With the support of Jhpiego and the Ministry of Health, Singida Regional Hospital has become a top performer in its adherence to national IPC standards. At the conclusion of an unannounced assessment by outside verifiers this past summer, the hospital attained a score of 74 percent adherence to IPC standards. It will be recognized by the Ministry with a certificate of excellence in IPC. Malunda says his nurses are seeing fewer wound infections following surgery, but only a hospital infection surveillance system could accurately record such impact and Singida isn’t equipped to implement one at this time.